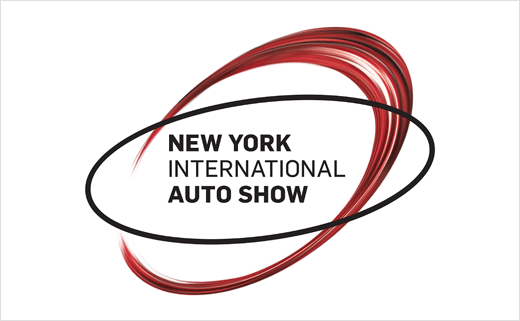 For reasons that are unclear it is in Manhattan, where only foreign-nationals and the insane drive cars, that the most important American auto show takes place each year. Chicago is bigger, but that's a consumer's show. Detroit stormed the scene in 1989 and has staked out an important place. 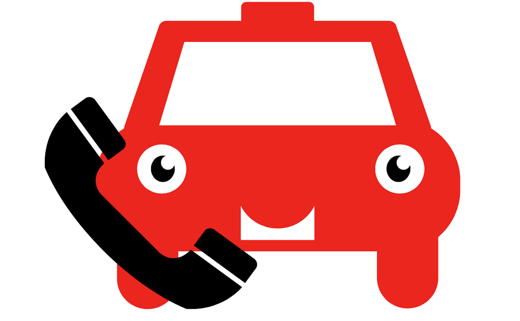 And LA is possibly trendier, and certainly makes more sense, but it doesn't see the important new vehicle premiers that New York does. 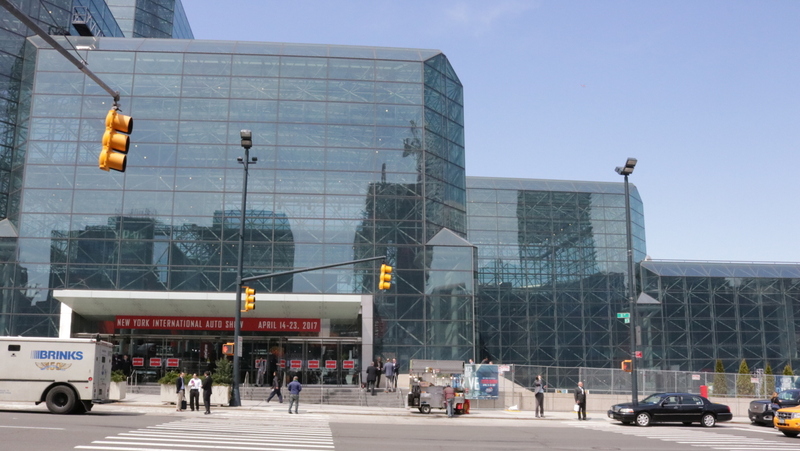 Perhaps it all comes down to timing: late Winter is early enough before Fall model introductions to show the new stuff without interfering with production schedules, and it gives the press enough time to pick their favorites and follow up with in-depth coverage of the important new iron, aluminum or carbon fiber. A recent report from Bloomberg compared horsepower and acceleration of cars from 1976 to the present. The dates were a little cherry-picked, but the results were very optimistic with both fuel mileage, horsepower and acceleration just about doubled. 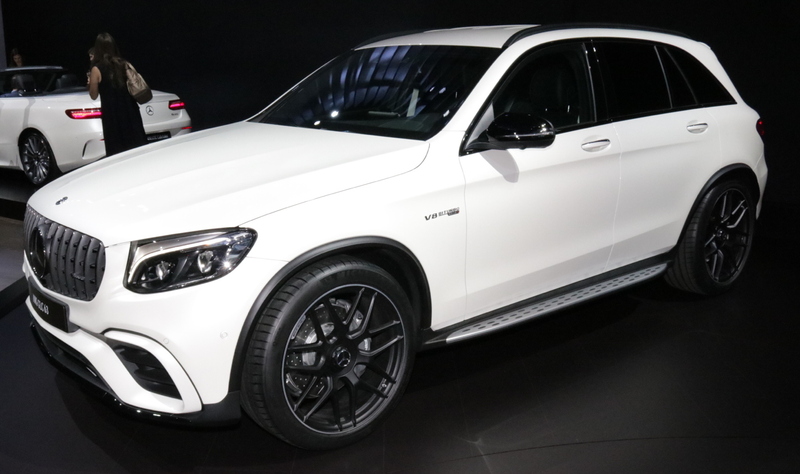 As part of that trend, Mercedes-AMG is still stuffing crazy powered V8 engines into small vehicles (just not the SLC roadster), its latest shoehorn being the GLC63. 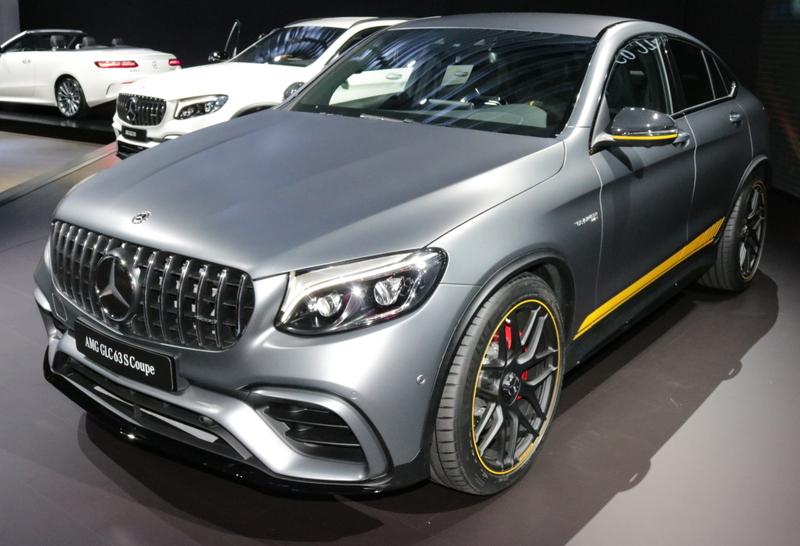 All-wheel-drive, 469 horsepower (or 503 in the GLC63 S Coupe), massive brakes and tires are just a few of the special tweaks this real AMG gets. 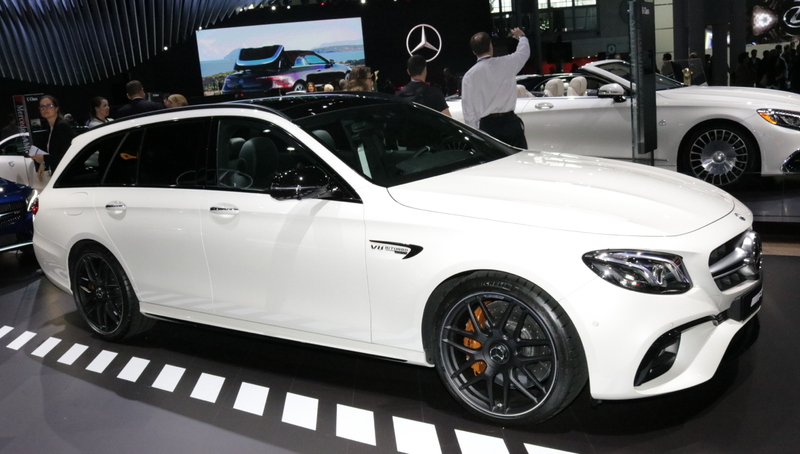 If you like 503 horsepower small SUV's you'll love this 603 horsepower station wagon. Feel free to take it to your local bodyshop for a woodgrain side applique. 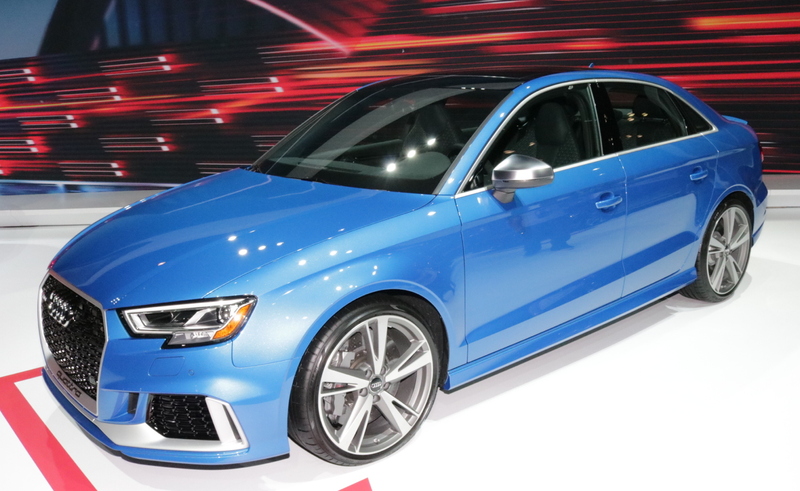 With a 400 horsepower turbocharged 5-cylinder engine, the RS 3 is America's first Audi RS compact sedan. Audi has previously been much more stingy to the US with its RS-badged cars, letting us have all of the S-badged lesser variants. If you care to stop as well as you go, carbon ceramic brakes will be an option. 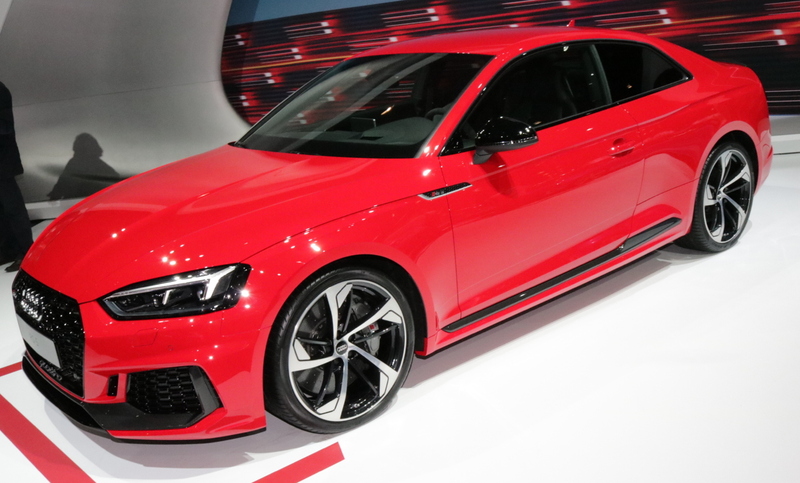 The RS 3 will become available soon as a 2017 model. Big brother to the RS 3, this RS 5 Coupe (convertibles and sportbacks will not be offered) will feature a 450 horsepower 2.9 V6. Featuring twin turbocharging, direct injection and variable valve timing, Audi's Quattro system will ensure good traction. 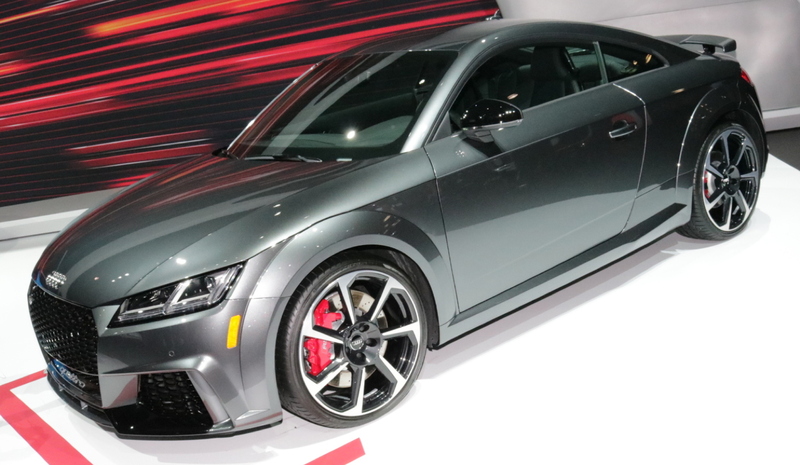 Finally, in its smallest package, Audi puts the 400 horsepower 5-cylinder into the TT RS. Only available as a coupe, Quattro all-wheel-drive, a seven-speed dual-clutch (automatic) transmission, and magnetic-ride adjustable suspension are all standard. Carbon ceramic brakes are optional. 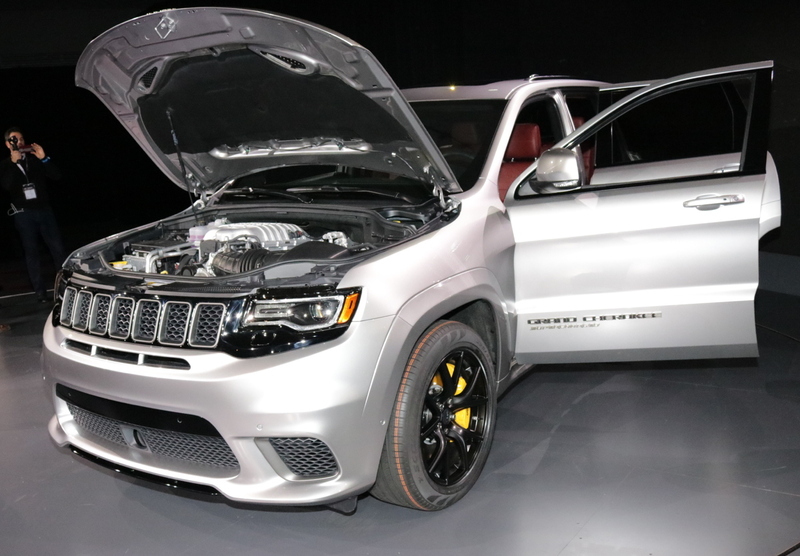 If you want to buy American and you want to totally embarrass that $100,000 Mercedes SUV, look no further than the 707 horsepower Jeep Grand Cherokee Trackhawk. While previous Jeep SRT versions have been detuned (probably to keep the all-wheel-drive alive), this one arrives with every horsepower hellcat-power alive and scratching. A supercharged 6.2 Hemi® V8, electronic launch control and an highly modified all-wheel-drive system result in a Jeep-reported 3.5 second zero-to-60 MPH run. We expect that to be beaten on sticky drag strips where owners not concerned with FCA warranty claim balance sheets will pound this Jeep a little harder. Since you will need a lot of help to stop this cat (bird? cat? what the hell is it?) 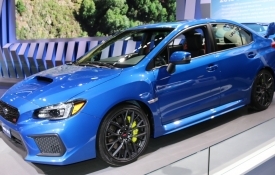 from its reported 180 MPH top speed, it comes with 15.75-inch front brake rotors. 500 horsepower doesn't sound like a lot these days, but this Porsche makes it from only six naturally aspirated cylinders. 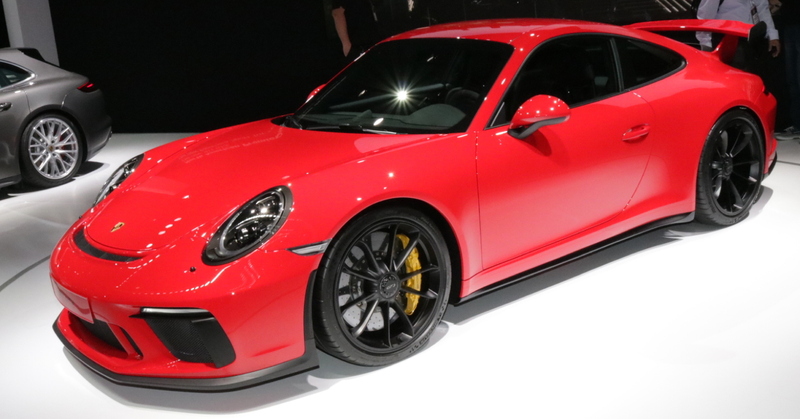 Whereas every single other engine in this performance vehicle list is pressurized by a supercharger or between one and four turbochargers, this mouth-breathing Porsche relies on the weight of Earth's atmosphere, alone. As it weighs 3116 pounds, it carries more than one pound less per horsepower than the 707 horsepower Grand Cherokee Trackhawk. 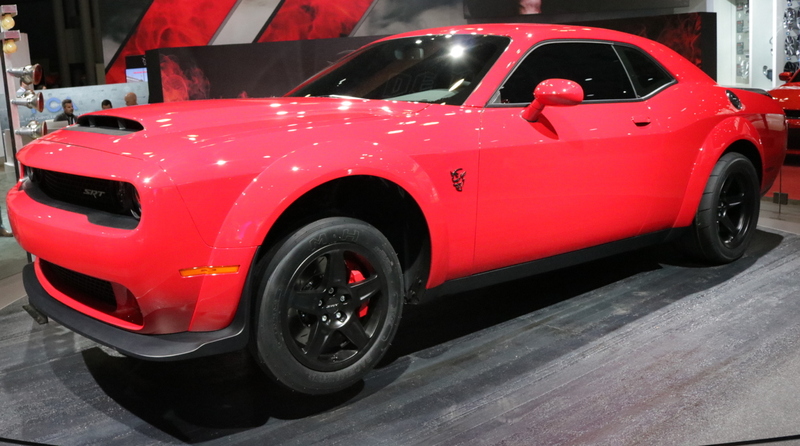 Now we're getting somewhere: 840 horsepower (technically only 808 without the track-only race computer, included with the "Demon Crate" at extra cost), a quarter-mile time of under 10 seconds (again, with the "Demon Crate" option), and a ban from NHRA sanctioned drag strips, the Dodge Challenger Demon is a pure halo car. Being almost useless on the street, it will serve only to attract thrill seekers to FCA showrooms where they can purchase lesser SRT cars that will bring them much more everyday pleasure without the cost or pain (Demon comes without back seat, front passenger seat, radio, trunk carpet, etc). As far as marketing, the only thing better than the NHRA ban for being too fast was the obviously engineered call for a complete ban from Automotive News! 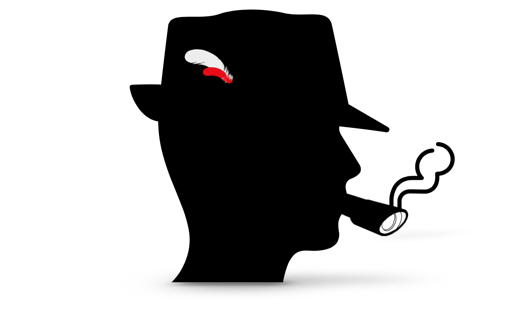 (Come on, the guy that wrote the editorial looks like Walter Mitty, and not from the movie.) The news coverage on the car is off the line (pun intended) and will result in far more interested parties than the 3300 units FCA will manufacture for the 2018 model year. Basically a souped up Hellcat, the Demon uses a larger supercharged with more boost, larger injectors, an extra fuel pump and stronger internals. Even a one-trick pony might have plenty up its sleeves (hooves) and the Demon includes a number of firsts in a production car, including a transmission brake, drag-mode launch assist that can squelch wheel-hop, street-legal drag tires, SRT Power Chiller that redirects air conditioned air to the intercooler, and "much, much more!" Look for the Demon in collectors' garages and at the track. 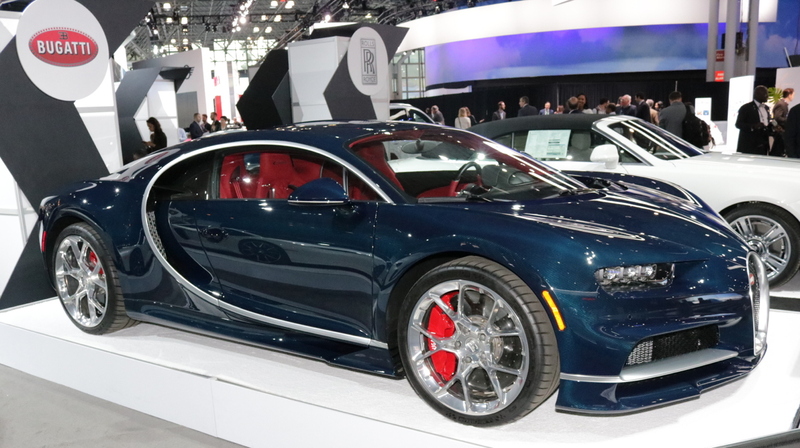 Of course, a story about horsepower can't leave out the new Bugatti Chiron, even though the New York Auto Show was not the first event for this 1479 horsepower ultra-car. Four turbochargers and 16-cylinders makes this the most massive power statement in a road-legal automobile. 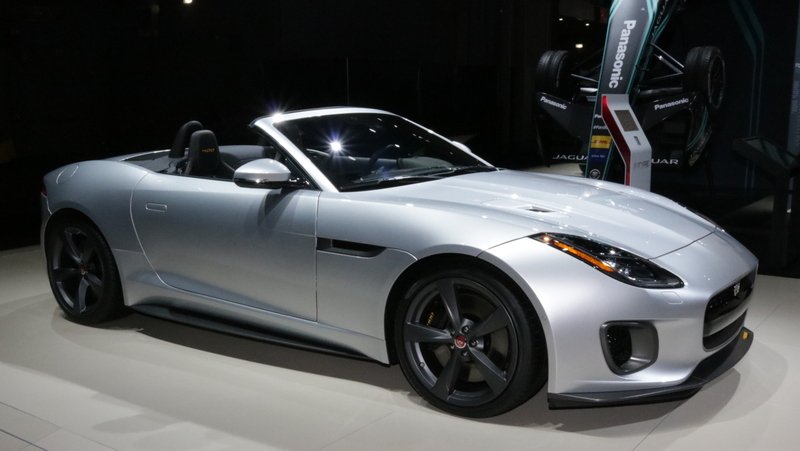 One of the most stylish rides at the New York Auto Show, the Jaguar F-Type, gets a refresh to its style inside and out, and a new entry-level model with a 2.0-liter turbocharged 4-cylinder. This same Ford-derived engine as in the XE, its horsepower is bumped to 296 for the F-Type. 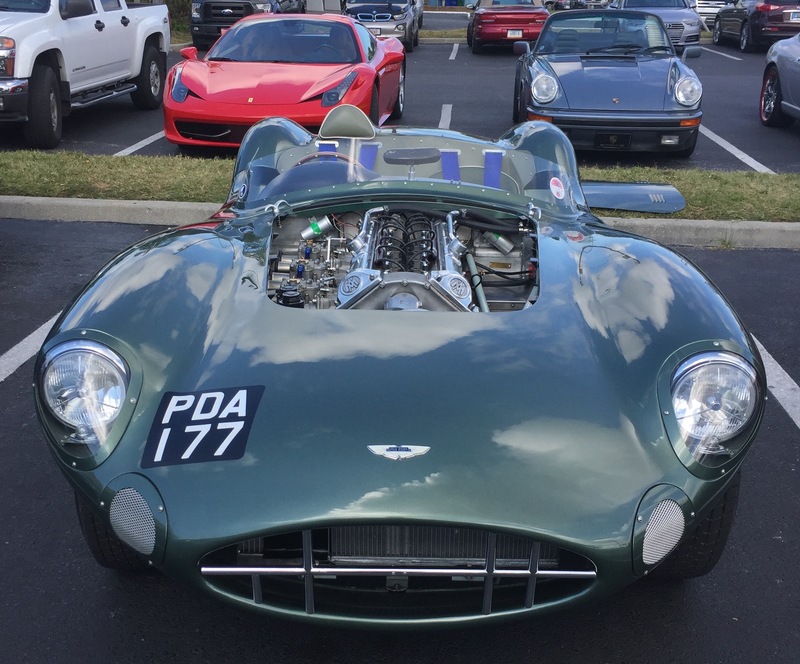 (No information on whether other Jaguars and Land Rovers with this engine will receive the extra power.) LED headlights replace xenon. 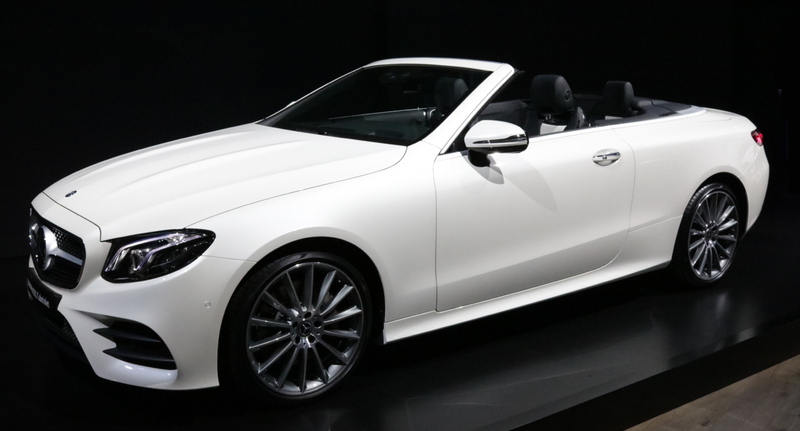 The new 2018 Mercedes E-Class Cabriolet completes the E-Class lineup with plenty of class. It will be available with 4MATIC all-wheel-drive for the first time. 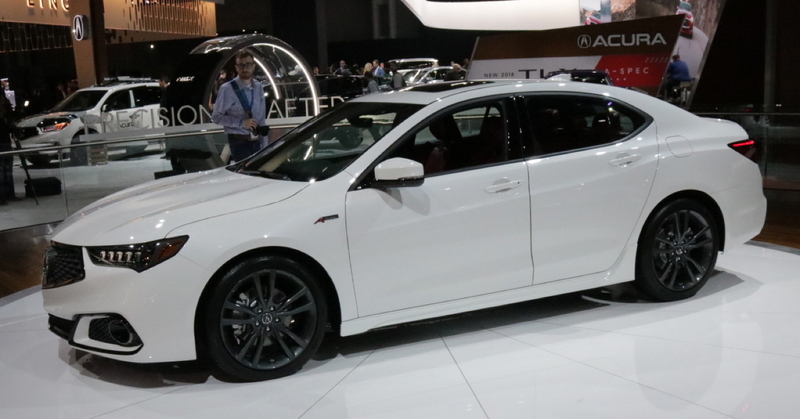 For 2018 the Acura TLX gets a refreshed design and loses the last vestiges of the "Acura Beak" that plagued Acuras for almost a decade. 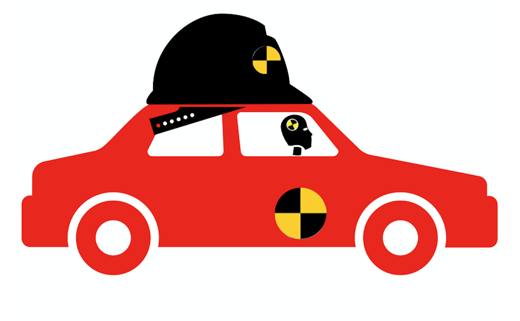 Called the Acura Shield, it looked like a high school shop class had a welding outfit, some galvanized sheet metal and no supervision. With its refreshed, clean grille, now details like the eight LED headlight units can draw attention. This particular model is an A-Spec, with 19-inch wheels and lots of blacked-out trim is a particularly handsome example. Larger tires and more agressive suspension are part of the A-Spec, which is only offered with the V6 engines. 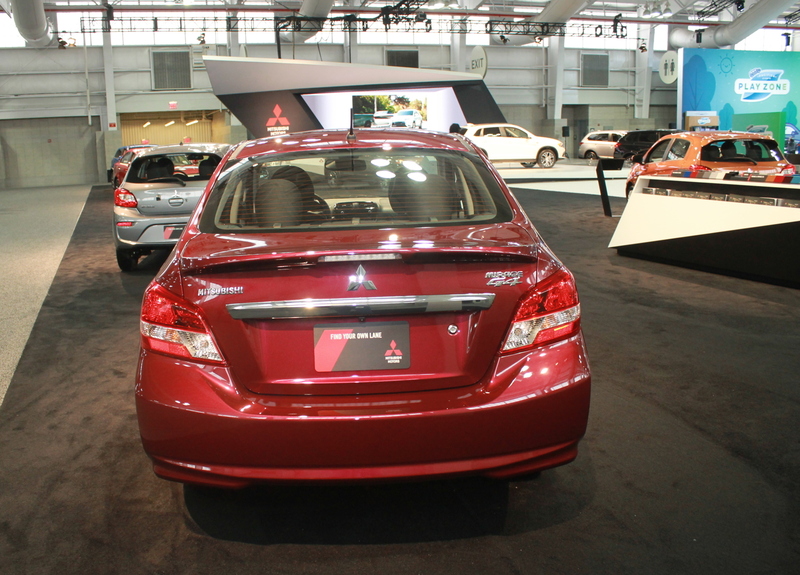 The 4 and 6-cylinder engines are the same at 206 and 290 horsepower, respectively. Another luxury sport sedan with a refresh is the Infiniti Q50. The differences are subtle, including continuing the front grille down through the bumper, smoothing out the sides and differentiating the different trim levels. Land Rover now has as many sport utility models as Ford. The Land Rover Range Rover Velar (Most of the vehicles price is for badges: they're charged by the letter.) is based on the Jaguar F-Pace, itself derived from the Jaguar XE, making it the most car-like Land Rover, yet. It's not a cute-ute, though, with an available towing capacity of up to 5500 pounds and ground clearance of 8.4 inches (up to 9.88 inches with optional air suspension) and as much as 380 horsepower. 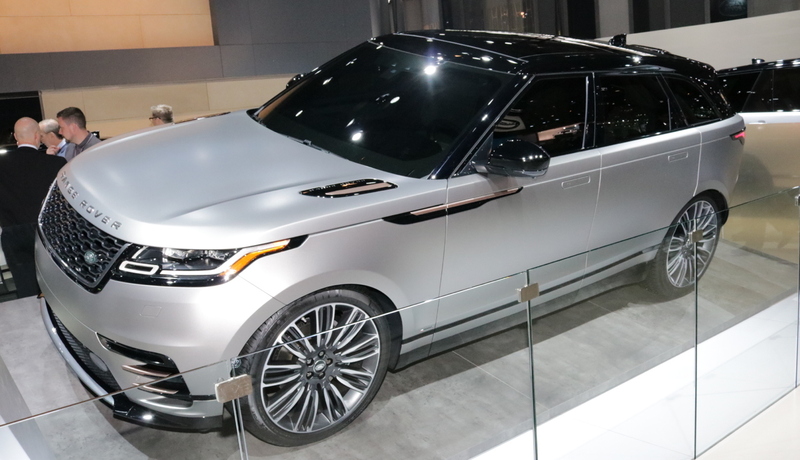 Named for a prototype Land Rover from the sixties that launched the Range Rover luxury sport utility brand, it is aiming to be the most stylish and hip member of the family. 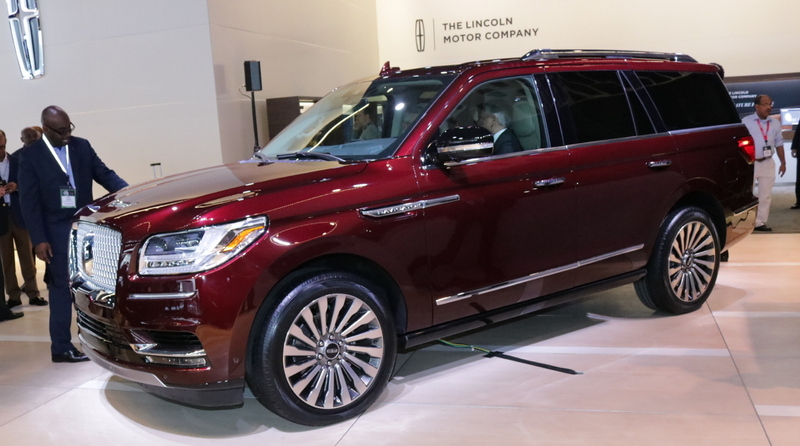 And finally, you can't be stylin' any more than in a Navigator. The original Hip Hop Bling car, the 2018 Navigator is beautiful, though not nearly as wild as the concept from last year's New York Auto Show. No seven foot long gull-wing doors. No cool terraced power running boards. It does have a 450 horsepower 3.5 twin-turbo V6 with a ten-speed automatic transmission, a super luxurious interior and all the usual bells and whistles, including an optional 30-way power driver's seat. In these hipster days, nothing's cooler than a station wagon. 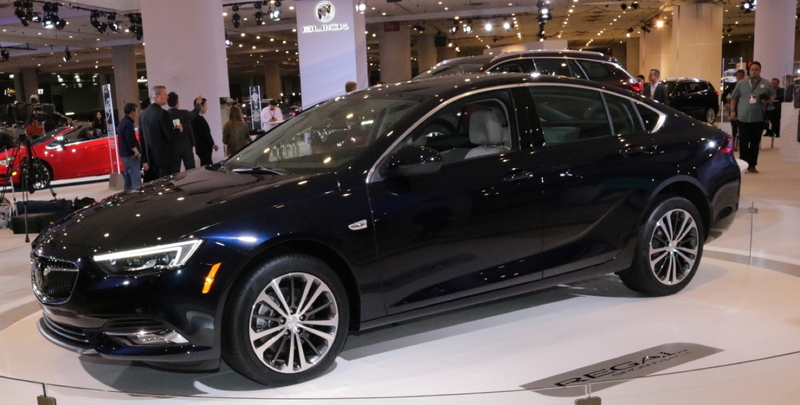 Buick has decided to buck the sedan hegemony; the new 2018 Regal will come only as a wagon or a hatchback. 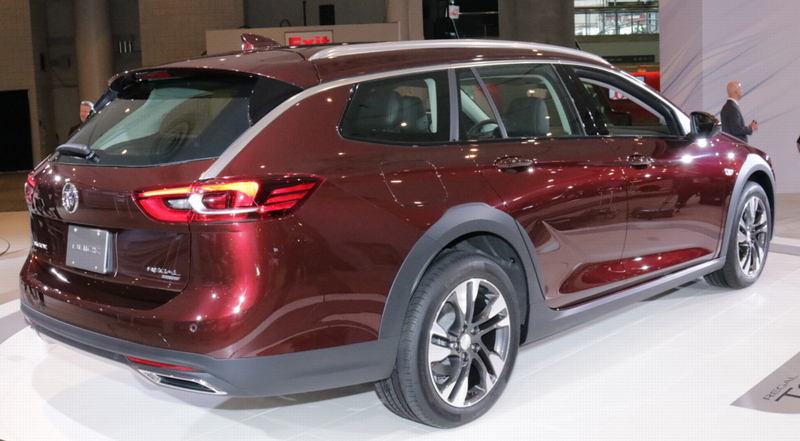 Of course, GM isn't cool enough to call them that; they're referred to as the TourX and Sportback, respectively. I told you, wagons are cool, now. You just can't call them that. Porsche's wagon is called the Panamera Sport Turismo. Crap! Family Truckster might still not be taken. 330, 440, 469 or 550 horsepower are available in this Stuttgart family car. It started life as the Scion C-HR, but when its mother passed on in childbirth, mama Toyota adopted it. 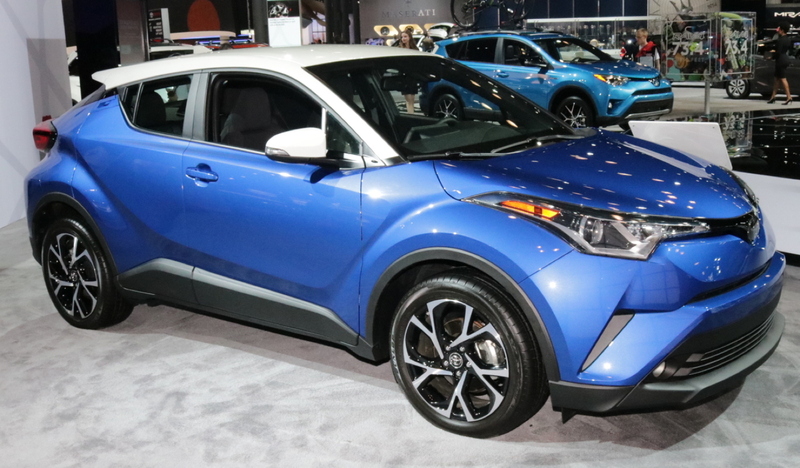 The C-HR was conceived as the quintessential Scion: edgy, cool and hip. 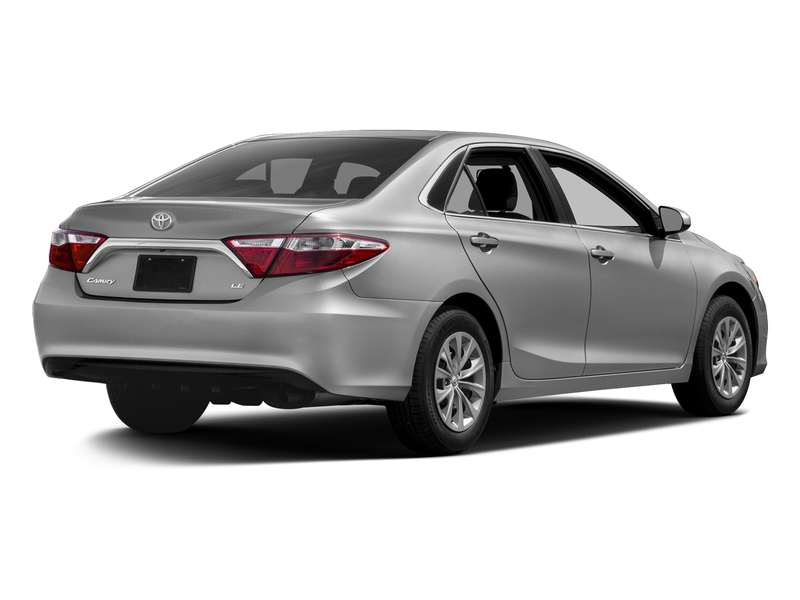 With its new "Toyota" badge and a 144 horsepower 4-cylinder, this may be the odd duck on the dealership lot. Cadillacs are cool. Racecars are cool. 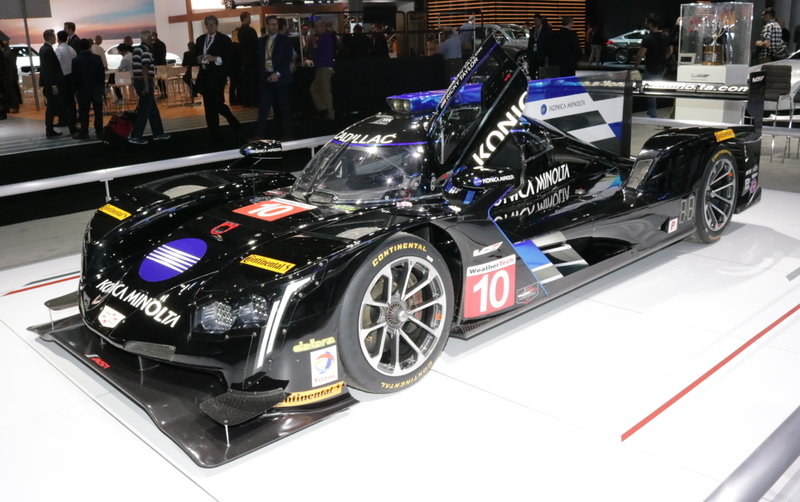 This is a Cadillac Konica Minolta IMSA Racecar. This Toyota FT-4X Concept is super cool. As a hint of a possible replacement for the niche-market FT Cruiser, this concept has it all: removable body panels, two-way cargo door (liftgate or dual side opening), a Go-Pro camera mounted in the driver's side rearview mirror, a cooling and a warming box. Inside it has large, colorful, simple controls, and a charming lack of electronics and "connected features." If you wander from the main hall, walking down an incredibly long hall filled with racecars and other car show detritus, you eventually reach the North Hall. This is where the awkward kids are exiled. 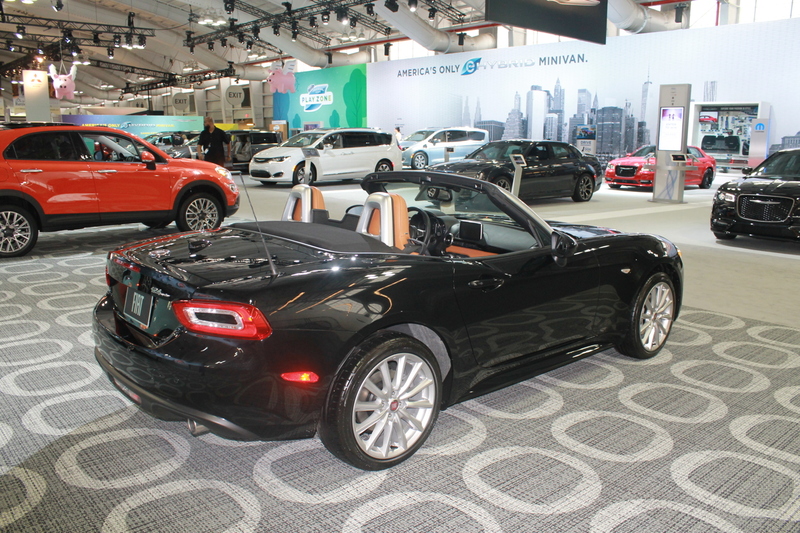 Fiat is represented, with their 124 Spider Abarth, 500, 500L and 500X. 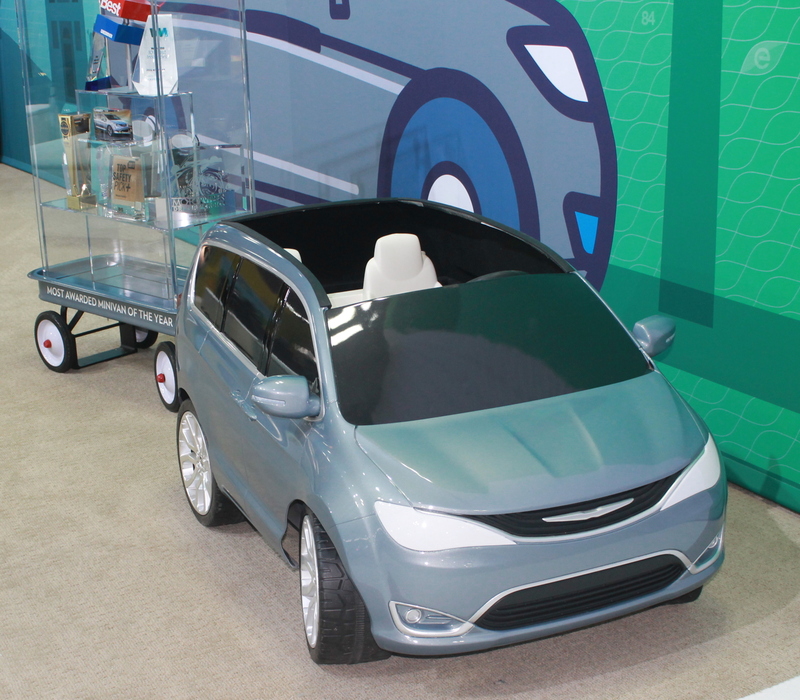 Also down here is Chrysler, with the cutest kiddie car Pacifica that will never be produced. Almost at the end of North Dungeon you find Mitsubishi, huddled in a corner crying softly. 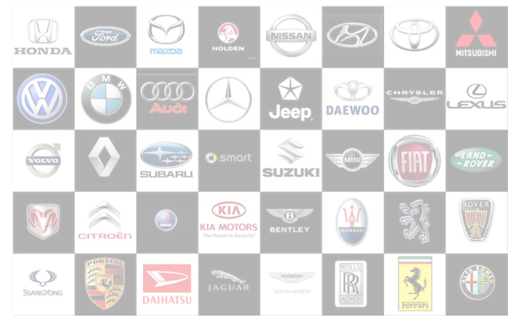 We'll have to see when their merger with Nissan/Renault will provide them with fresh product. Surprisingly, their new Eclipse Cross didn't show up.